What to carry when there isn't room to take along the entire Bible? 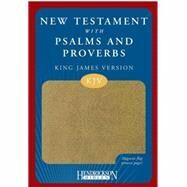 Hendrickson's answer is the affordable KJV New Testament with Psalms and Proverbs. This testament's slim profile makes it easy to slip into a coat pocket, purse, or backpack. Loaded with features that you won't find in many whole Bibles, it's a thoughtful gift for travelers, hospital visitors, evangelists, and new believers alike. And the book is constructed from quality materials that will help it withstand heavy use. Of special note is the fact that this testament is available with a classy magnetic flap that offers extra protection to the book's page edge. Die cut window displays binding color; tan flexisoft.